Since our inception, Global Gold and Silver has maintained a fine reputation at buying platinum and diamond jewelry. When you sell your jewelry to us, you can rest assured that we pay the most competitive prices for your collection. We are also offering secure, discreet, and fast services to ensure a stellar sales experience with us. What are Platinum & Diamond? Platinum is a type of white metal that looks almost like silver. It is an alternative to silver and white gold for people who prefer to own jewelry made in a white metal. Platinum is often considered the most expensive and prestigious metal of the standard three precious metals. Unlike white gold, platinum is not yellow-tinged. It is naturally white, does not tarnish, is harder to break, and can be repaired by almost any jewelers. Diamonds are one of nature’s greatest wonders and has been the gem of choice for engagement rings for many decades. The diamond octahedron possesses the shape we often describe as a diamond. While that is the most common shape for a diamond crystal, dodecahedra, cubes, and a combination of those three shapes are common. Next, diamond is renowned for its hardness and ability to resist scratches. Only a diamond can scratch another diamond. 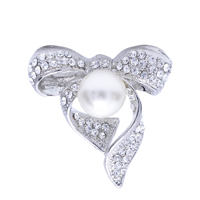 We buy Platinum and Diamond including Brooches. Should You Sell Your Platinum Jewelry? Yes. If you are in need of cash, selling your platinum and diamond jewelry is feasible. Platinum is a very popular type of metal used in jewelry. The white metal has a high value and that's why it is combined with diamonds to form wedding bands. When you are ready to sell your platinum jewelry, it is recommended that you shop around to check which jeweler can provide you with the best deal. Do keep in mind that different settings, designs, and engravings can be of higher value than others. Your jewelry will be worth more if it is vintage or Victorian. Why Sell Platinum & Diamond to Global Gold and Silver? Global Gold and Silver strives to put our customers' desires first, no matter what. As a respected platinum & diamond buyer, we steer well clear of dubious practices. Our company constantly highly-touted jewelry appraisers for results you can be satisfied with. We have been in the business for over 60 years and were able to achieve A+ ratings from the BBB. Next, our team has an unwavering commitment to providing the highest level of customer service in the industry. Whether you are selling platinum and diamond jewelry in Manhattan or New Jersey, we have got your back. When it comes to selling platinum, we make sure the platinum test procedures are performed in front them. You can rest assured that all of our equipment adheres to the latest regulations. It is no secret that Global Gold and Silver has a constant goal to help our valued clients make informed decisions. When you consult Global Gold and Silver, you are not obliged to sell any of your platinum or diamond possessions. We want our customers to acquire a deeper understanding of how selling platinum and diamond in NYC works, and that's why certain services are free of charge.